Painful symptoms arising from exposed dentine are common in the adult population. 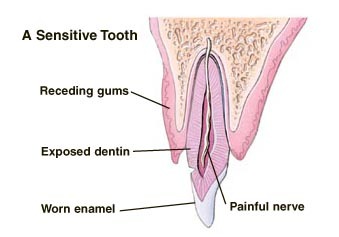 Sensitive teeth or dentine sensitivity (hypersensitivity) is characterized by pain, elicited by various stimuli, that disappears when the stimulus is removed. Some people are sensitive to cold alone, others to touch, sweet or sour foods or combination of any of these stimuli. Pain may be so severe that they may find eating difficulty. Our teeth are made up of three layers – enamel, dentine and pulp. Tooth enamel is the hardest and most highly mineralized substance in our body; however it does not mean that it is immune to its surroundings. Exposure of dentine can arise from either the removal of enamel or stripping of the tooth root surface. Erosion (superficial loss of tooth surface as a result of chemical process, usually from non-bacterial acids) by acidic foods or gastroesophageal reflux disease (acid reflux). Initially, toothbrush abrasion can cause trauma to the gums, which can appear as red, brushing or depressed lesions. Long-term abrasion can lead to gum recession or clefts on the gums. The receding gum margins will expose the root surface of the tooth which is thinner than the tooth enamel of the crown and can result in notches and sensitive teeth. Why do sensitive teeth occur? The most widely accepted theory for sensitive tooth is the hydrodynamic mechanism. Dentine contains many thousands of microscopic tubular structures that radiate outwards from the pulp. Blast of air, or hot and cold stimuli will cause rapid movement of the fluid within dentinal tubules (channels). This movement will cause to reach the adjacent nerve fibers in the pulp and nerve deformation causes sensitive teeth pain. Sodium fluoride – this usually comes in paste form containing equal parts by weight of sodium fluoride, kaolin and glycerin. Paste is burnished into the previously dried sensitive areas for about 3 minutes, and fluoride from sodium salts is taken up by dentine making it more resistance to acid decalcification by increasing secondary dentine formation. It should be applied frequently for maximum effectiveness. Stannous fluoride – it is applied in the form of gel which inactivates the enzymatic activity in the dentine. Stannous fluoride induces mineralization within the dentinal tubules thus creating the calcific barrier. Sodium monofluorophosphate – this fluoride salt is widely used in toothpastes but it is of uncertain efficacy as a desensitizing agent. It is hydrolyzed on the surface of enamel and dentine which releases fluoride ions that are then incorporated into the tooth structure. Potassium nitrate – this compound occludes the dentinal tubules. These potassium ions desensitize the nerve endings within the tubules, causing them to be less responsive to the triggers. Strontium chloride – strontium ions have strong affinity to calcified tissues. It accelerates the rate of calcification and these ions obliterate the dentinal tubules. Dental sealants – various resins and adhesives are applied for sealing of dentinal tubules. These act as a mechanical barrier to the external stimuli. Tooth preparations like acid etching are required before application of these materials. The use should be restricted to the more persistent cases of dentinal sensitivity. Fluoride varnish – topical fluoride is applied to the exposed dentine or root surface to reduce sensitivity. Brush thoroughly twice a day (preferably in the morning and before bed) using a soft bristled toothbrush and clean between teeth daily in areas where your toothbrush can not reach. Use fluoridated dental products with advice from your dentist. Cut down on carbonated soft drinks and acidic foods. Avoid teeth grinding or use mouth guards at night if you have bruxism. Visit your dentist regularly (at least twice a year) for a professional cleaning, fluoride treatments and examination of your mouth. This entry was posted in Oral Care and tagged sensitive teeth causes, sensitive teeth pain, sensitive teeth toothpaste, sensitive tooth, sensitivity in tooth, teeth whitening sensitive, treatment sensitive teeth, why sensitive teeth on August 7, 2011 by oileng.